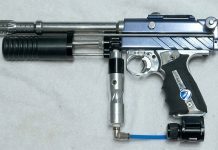 A look at what I believe is a custom Jeff Orr Minicocker that was likely machine in the mid 1990s and then re built with updated components around 2000. 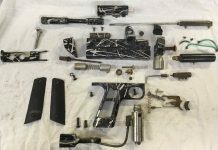 As I parted out this WGP 1999 Mini STO I took photos of piece of the pieces so I could eventually re assemble them on another Autococker / Minicocker body. John Gross likely cut up this reverse backblock Minicocker in the mid 1990s. Christian Van Horn purchased it and restored it last year. 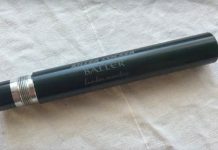 This style Minicocker barrel came on early Worr Game Product Minicockers that premiered around 1992 to 93. This barrel is engraved with with some text. Two custom Minicockers courtesy of Rick Cendejas. 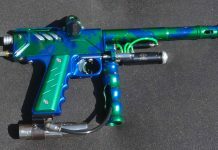 An original Ironmen Autococker, and a Splash Mini that Rick built himself around late 1993 / early 1994. 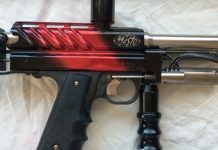 A look at a 1999 Mini STO Minicocker with a red to black splash and P block. 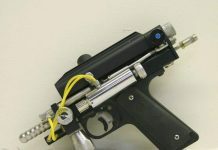 This Autococker was purchased from a local seller and has STO pneumatics. 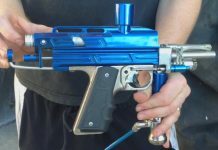 Benji and I look over a Splat Attack Revenge V1 Autococker, with the serial SA03RE. 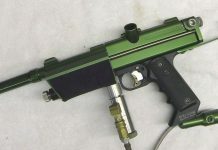 RKB Engineering’s Green Machine Minicocker c.92-94? 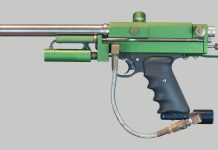 The history on RKB Engineering Green Machine Minicockers and a look at an early example owned by a Doom Troopers player, with info from Russell Breeden. 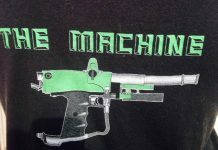 Tina "GoldenGirl" Ruzzo sent over these photo of her husbands RKB Engineering "Machine" Minicocker T-shirt which came with Russell Breeden's Cockers. 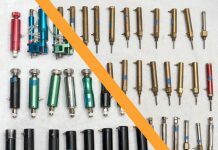 An assortment of Autococker Rams and Low Pressure Regulators including Shocktech, WGP, ANS and Kapp. Also including some info on testing rams. 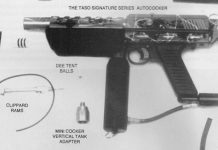 Dissection of a TASO ad featuring one of the Taso Signature Series Autocockers and other period accessories from 1994 to early 1995. 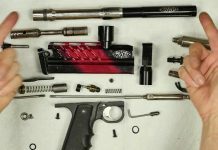 Russell Breeden, of RKB Engineering, explains the earliest aftermarket 3 ways and Rams that he designed and Keith Roll shows and example on his minicocker. A mysterious P Blocked Reverse Minicocker I bought a while back. It wasn't made by Brad Nestle and I don't know who cut it. 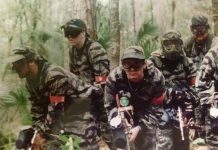 Robert Peterson, of Team Strange, helped identify photos, memorabilia and logos relating to the team from the mid 90s. 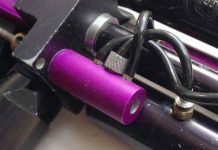 With help from Jason Henley and Adam Schultz I've put together some information on Mid 90s Mini's Belsales Evolution Autocockers. 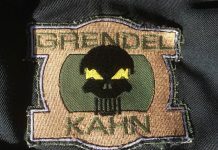 Benji showed me this Jackal Phase II Minicocker last week. It's in really nice shape and the color is a solid blue. 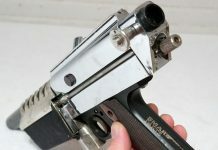 Dan Debone, former Service Manager of Palmer's Pursuit Shop, comments on Autococker and VM mods as well Palmer's first Double Barrel Semi Automatic. 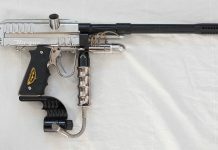 A nice looking Chrome Minicocker with some unique parts such as a Smart Parts engraved 45 frame. 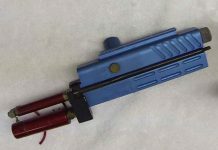 A neat example of the MF2 Micrococker by MF2 Designs. 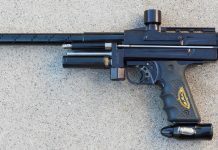 A rare Autococker from the mid to late 90s that was very compact and designed in Canada.